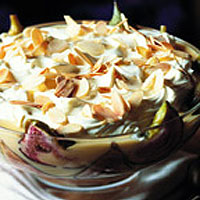 A Spanish-style trifle with honey-roasted figs and a lemon and cinnamon custard. Preheat the oven to 200°C, gas mark 6. Split each trifle sponge horizontally and place half of the sponges in a single layer in the base of a large glass trifle bowl. Spoon over half of the sherry and leave to soak. Place the fig halves in a large roasting tin and drizzle with the honey. Place in the oven and roast for 10 minutes until soft and caramelised. Remove from the oven and leave to cool. Place 6 of the fig halves on top of the soaked sponges, then top with the remaining sponge halves. Spoon over the remaining sherry and set aside to soak. Meanwhile, mix the cornflour in a small bowl with 3 tablespoons of the milk and set aside. Pour the remaining milk into a saucepan. Peel strips of zest from the lemon using a vegetable peeler and place in the milk with the cinnamon stick. Bring to the boil, then remove from the heat. Place the egg yolks and sugar in a large bowl and beat together to mix. Strain the milk, discarding the cinnamon and lemon, and pour into the egg mixture, combining well. Stir in the cornflour mix and return the custard to the saucepan and heat gently until thickened, stirring all the time. Remove from the heat and leave to cool. Place the remaining fig halves up the sides of the glass bowl, flesh side facing out, and drizzle any juices from the roasting tin onto the sponge. Spoon the custard into the centre, cover with clingfilm and chill. Whip the cream until lightly thickened and spoon over the top of the custard. Cover with the clingfilm again, ready to transport. Bring the pack of toasted flaked almonds. As sherry is an ingredient in the recipe, why not marry the flavours of the food and the drink?